The Fellowship was fortunate enough to obtain a copy of THE TRIALS AND TRIBULATIONS OF MISS TILNEY from Dusk Comics. The story is by David Doub with art by Sarah Elkins and Danielle Alexis St. Pierre. In Victorian London, Miss Henrietta Tilney wants to write a real story, not the columns she has been doing. So on her first assignment; she is to interview Lord Beowulf Harwood – an accused mass murder. During the interview, she begins to believe his story that he was setup and that dark magic was involved. She helps Lord Harwood and his friend Doctor Plum escape and the trio tries to find out who’s responsible for the murders. Will she live to finish her first story as a reporter? I love the way Miss Tilney uses all of her resources to get things done, including the using the mindset of men towards women to her advantage. Doub knows how to handle female leads - he also wrote DUSK (you can read our review here). Sarah Elkins’ art is beautiful and Danielle Alexis St. Pierre’s colors set a very nice mood. If you want a nice, little mystery with some action and smart characters this is definitely worth a look. 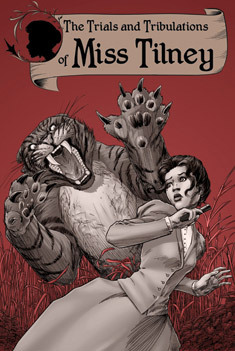 THE TRIALS AND TRIBULATIONS OF MISS TILNEY is available on Amazon or at www.duskcomics.com.